Have you noticed how often apps on smartphones, tablets, and computers are updated? We get notifications about them on a constant basis. The same pattern applies to marketing strategies. Companies need to use the latest tools on their strategies for effective results. Finding these tools isn’t the hard part. It’s keeping up with the competition that will make or break the company. Why? Well, what was effective yesterday may not be effective today. One thing marketers can expect in the digital world are these drastic changes. And there are a lot of them. There could be a lot of reasons why your business isn’t able to meet this part of the equation. Perhaps your business is still in its early stages. Or you’re not investing in this area at the moment. Or you’re not aware of how important it is to leverage MarTech in your business. 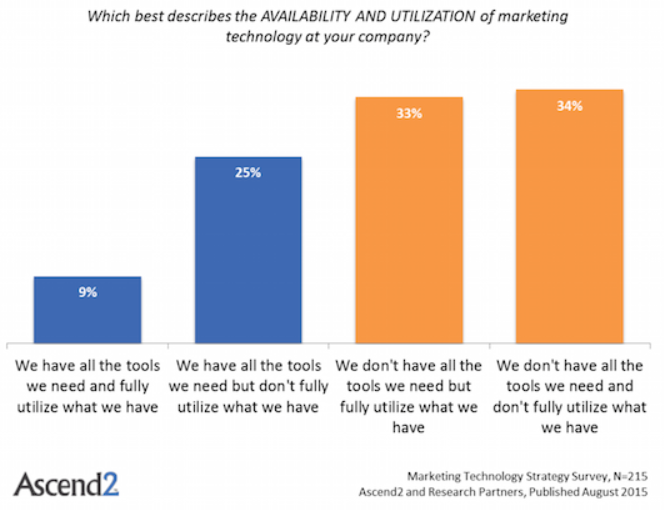 Well, it turns out that only 9 percent of marketing companies have the necessary marketing tools to compete. And what happened to the rest, you ask? Let’s take a look at some research conducted by Ascend2 and Research Partners. 25 percent claimed they had all the tools but failed to utilise them, 33 percent don’t have all the tools but make sure to fully utilise what they had, and 34 percent said they never achieved either. In this tech savvy age, companies need to focus their energy in MarTech. Marketing technology offers an incredible amount of value, and doesn’t require much from anyone who wants to learn more about it. Considering the figures we mentioned, there’s a great opportunity for companies to get ahead of their competition. Dive into the world of online marketing. Learn how to stay ahead of the competition by brushing up on the newer, more advanced techniques of MarTech. Social media garners millions of customers from every industry. But marketers can become confused while managing several platforms simultaneously. Not to mention, you need to accomplish and monitor minor tasks on a constant basis. With only two hands, it’s not always easy to keep up. That’s why Hootsuite came up with a solution to meet the demands of today’s digital world. Integrating your social media platforms onto Hootsuite means you’ll switching from different windows on your browser. All types of activity can be monitored on a regular basis through a single dashboard. Hootsuite Enterprise offers features such as publishing, engagement, analytics and more. If you would like to know more about it, get in touch with us. We’re Hootsuite’s Digital Services Partner in New Zealand.